We usually think about archives as places of abundance. Deep, rich sites that house a multitude of perspectives. This can certainly be true, but archives are also sites of erasure, allowing some voices or perspectives to be minimized and excluded when they don’t fit into normative narratives. Rather, it’s a complex, evolving structure defined by the institutions that serve as portals to cultural material—museums, libraries, courts, and archives like this one. They carry a responsibility to give (or deny) access to materials that traverse in and out of the public domain. But as an institutional construct, the public domain can easily fail to reflect any true nature of “the public;” without careful consideration, access to the public domain ends up repeating and perpetuating, in a highly predictable way, the same oppressive structures that govern society and culture. I’m really grateful to the Internet Archive for inviting me to help shape their effort to present newly available material in the public domain. 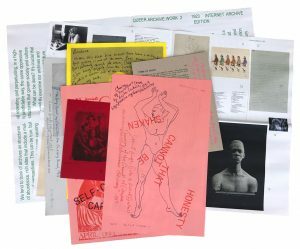 During my residency here, for the last 3 weeks, I’ve been searching archive.org for forgotten material — in particular, evidence of African-American culture, Native American culture, early LGBTQ voices, and other artifacts from 1923 that in the past would have been forgotten or actively left out of celebrations of open access culture. If something seemed to be missing, I tried to find it elsewhere and upload it to archive.org. Remarkably, I found the first openly lesbian book of poetry ever published in North America, On A Grey Thread, by the Bay-area poet Elsa Gidlow, from 1923. It had never been digitized, but a PDF from the author’s estate was sent to me for this project and is now online, as of a few days ago. 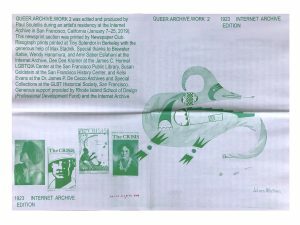 The result is QUEER.ARCHIVE.WORK 2, 1923 INTERNET ARCHIVE EDITION. It’s an edition of 100 copies that I edited, designed, and printed myself at a small press in Berkeley, and it features 15 lesser-known historical artifacts. All of it is now available on archive.org. I’m very proud that the Internet Archive enabled me to create this project. 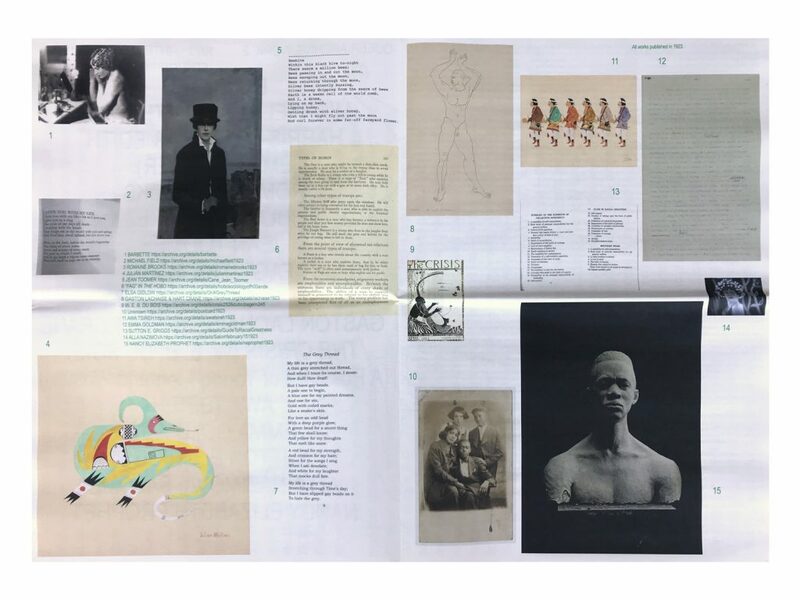 By bringing these items together in a loose assemblage, in the form of a publication, my hope is to create a place for forgotten voices to co-mingle. I think by doing more of this work, we can challenge what we think or assume we know about the early years of the 20th century, and imagine other kinds of histories. It’s such a good thing that the internet archive exists, right? I’m so glad that this exists. I look forward to my students finding this when they explore the site for their Public Domain project. Brewster you brought me back to the libraries. The love of books renewed, which was 30 years afar. Of course the variety has changed from fiction to others. Thanks to the team with you.